I suppose I am truly getting back into the swing of homeschooling. All summer I have been avoiding the thought of September and returning to the grind. I recently did all my book ordering, and as things arrived in the mail found myself getting excited (against my will!) at the thought of a new school year beginning. Today being the first day in a while I have had "nothing" to do, I sat down this afternoon and wrote my IHIPs for Rachel, Julia and Ben (!--the very first report I have had to write for Ben....) By the way, if you don't know, an IHIP is an Individualized Home Instruction Plan, and all it boils down to is a list of texts used for each subject. Now all I have to do is plan some lessons! This year I am handing the math and science reins over to Matt in Rachel's case. I was finding that I didn't have enough time what with the other kids' schoolwork, plus all our activities and house stuff to do these subjects justice at Rachel's level. It's one thing to explain something like addition or multiplication when you're doing ten other things simultaneously, and quite another to explain concepts you have little or no memory of ever having learned yourself! So Matt will for the first time be a teacher of academic subjects in our family. He and Rachel will do biology and algebra together in the evenings while I remain blissfully ignorant of the whole thing. I have decided to change my lesson planning to a weekly plan. In the past I have meticulously planned each day's work. So the girls literally opened their planners and Monday might say read chapter 7 in science, pages 200-235 in history and write essay #4, pages 113-116 in math, etc. etc. However, that got tough last year when I had 3 lesson plans to do--and Ben was only doing kindergarten level work. So I thought about it and decided it would be far easier to have a master lesson plan book, with everyone's work in the same place, and to have a plan so that the girls can decide how they want to do their work each week. For instance, Rachel may decide to do every subject daily. Julia might prefer to do all her math in one day, all her history on another day, all her language arts work another day, etc. I will decide what Ben does since he still needs too much direction. Anyway, this will give them some control over the way they work, which they always enjoy, and it will make planning easier for me because I can simply write a bulk of pages in a given subject rather than thinking about each day. I also won't need to think as hard about outside activities, because if we're busy one afternoon, they can just do the work another time and not worry about being behind. And yes, before you think it, I know this could lead to getting really very behind--in a certain type of family. However, I have already thought about that and have decided that giving them some autonomy when it doesn't really matter will be a better lesson. They will learn very quickly what happens if their work doesn't get done--because they will not be allowed to use the computer, talk on the phone, watch tv or go outside to play before some amount of schoolwork is shown to me. 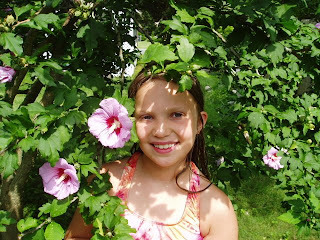 Because we have fairly strict homeschooling laws in NY, I am very careful that I don't slack off--to the extent that we go in the opposite direction. Because my kids have always had this standard, I don't worry that they will see this new plan as a way to avoid their work. However, I do have to say that although I'm getting excited about new books, lessons, and school supplies--I will miss summer dreadfully! Lazy mornings, swimming, playing outside, casual meals whenever we feel like it, late bedtimes. Going back to the old routine is just always a drag, no matter how much your kids like school. We only have 10 days left of summer vacation, and I plan to wring every bit of fun out of them! Ben Rides His Two Wheeler! After weeks of trying, Ben rode his bike today! He has wanted to ride for a long time, and resisted any suggestion of training wheels. However, cautious by nature, he also didn't like the idea of falling and getting cut, and so when Matt or I tried to help him learn to ride, he didn't want us to let go of the bike. Naturally, this didn't help him learn very effectively! He then moved to trying to ride it himself, and I coached him from the sidelines. I explained that if he just let go and pedaled rapidly, the bike would stay upright and he'd be riding--but he always put a foot down. Then today our friend and neighbor Matthew came over and was with Ben in the driveway. He asked if he could take Ben across to Heights Place, which is a "T" with our street and as it just connects our road with the one parallel to it, has almost no traffic. I agreed, and went to sit in the hammock swing to watch--and to my amazement, Ben was riding all on his own in just a few minutes! Somebody should give Matthew a teacher of the year award! We have had a crazy week! Two parties for the kids, one with friends and one with extended family. A 50th anniversary party for my parents and all the travel it entailed. Plus my best friend, Jenn, and her family visiting from NC...it was a wonderful week, and also an extremely tiring one. As promised, here are a few photos from the birthday party. Emma in her Rose Petal Cottage.....ah! It feels great to put your feet up after a long day! 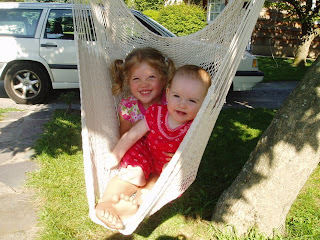 Emma and her favorite baby friend in the hammock chair out front, during the party. Birthday cake! This one was Ben's cake (note the 7 candles--one for good luck). He wanted vanilla cake with strawberry frosting. Emma's was chocolate cake with whipped cream and rainbow sprinkles. They blew out the candles at the same time, though, and then the guests got their choice of cake. Today Emma is four years old! I am finding it hard to believe I don't have any babies left....but when I said to her last night that I couldn't believe she was getting so big and wasn't my baby anymore, she looked up at me with those big blue eyes of hers and said solemnly, "I will always be your baby, Mama." Four years ago right now I was on the screened porch at our house on Dolphin Way, on a cool rainy morning, almost ready to push. (I don't know the exact time it was, but since she was born with just two pushes it wasn't long!) Rachel was running between the dining room and the porch, checking on my progress and reporting back to our friend Amie, who was helping Julia and Ben make cards for their baby. By the time everyone got out to us, after Rachel reported that the baby was almost here, Emma had already made her grand entrance into the world. It is so odd to think that Julia is now as old as Rachel was that day, and that Emma is almost as old as Julia was that day! Things have changed so much in those four years. And two years ago today, we moved into this house. We joked that it was the only birthday that Emma would get a house for her gift, but in fact, we were wrong! This morning when she woke up (extremely early for her, at 7:30! 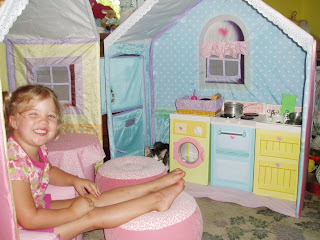 She was so excited it was her birthday, finally, that she just couldn't stay asleep) her gift was waiting for her in the living room---the Rose Petal Cottage play house! Matt set it up last night because I knew she'd want to play with it as soon as she saw it, and that there was no way for me to get it set up with all the other things I have to do today, preparing for the birthday party this afternoon. So we set everything up and covered it with a quilt instead of the traditional gift wrapping. Was she amazed! We got her the cottage itself, which also comes with a stove. Grandma Barbara got her the sink and a comfortable lounge chair, and her sisters and brother together got her the table and chairs set (which is really two round ottoman-like seats and a tiny table with tablecloth.) She said, "I've always wanted my very own house!" The idea of it is that you play with the two halves of the house open at an angle, like scenery in a play. The two pieces actually nest together for efficient storage. However, you can put it together if you want to have a "real" cottage. At first that's what Emma wanted to do. Once she was in it, she said, "This is a very tiny house!" Ben's response: "Well, Emma, that's what it's like when you live alone!" Want to Read a Pretentious Magazine? I admit it. I sign up for magazine subscriptions sometimes because of the freebie they offer. And I am a sucker for tote bags. I got a mailing some weeks ago for a new parenting magazine called Cookie, and I loved the tote bag they were giving away--it's striped in chocolate brown, pink, aqua and yellow and is just very pretty. And the subscription was under $10, and the ad made it sound pretty good, so I figured, why not? Well. I don't think I have ever read such a pretentious piece of junk masquerading as a parenting magazine. This is clearly designated for parents who are trying to be like TomKat or Brangelina.....not your regular everyday parents who may actually have to, say, WORK for a living. I also think that most parenting magazines try to help parents out by offering tips on how to promote family closeness, have fun with your kids, and discipline effectively. Cookie, on the other hand, seems to be all about what you can buy for your family (or yourselves) and how you can be the best...and by best, I mean who has the most material possessions and who can afford the best preschool/kindergarten/private school. Here are a few examples. --- On page 26, there are "coupons" for Cookie readers, cleverly called Cookie Dough. This includes a 25% discount on cashmere t shirts at Mai--for the bargain price of $281! Well, considering they are $375 T shirts, I guess that's a wonderful savings! However, I don't know anyone who wears $375 T shirts, much less parents who would wear one! And what exactly is a cashmere T shirt, anyway??? ---On page 50, they talk about "education vacations," where hotels offer classes for children while you travel--the Peninsula Hotel calls it "Peninsula Kids Academy," well la di da...these classes include filmmaking in Beverly Hills, kite making in Beijing, Filipino cooking in Manila, private surfing lessons in California, golf in Las Vegas, and songwriting in Nashville. Naturally. Because we all go on vacation in order to put our kids in an academy....and of course the picture to illustrate it all is two little girls in dresses, playing the violin. Get ready for Juilliard, everybody! We wouldn't want a vacation to be simple fun and relaxation or anything....and notice I'm not even saying anything about how many of my friends have taken their kids to Beijing or Manila lately! --On page 62, they have the newest kids' fashions for the school year. This includes an outfit pictured on a girl who is definitely not older than 7 years old--that costs over $200. For one outfit. However, that isn't even the best part. The BEST part is--this outfit is absolutely the ugliest, stupidest thing I have ever seen. Emma took one look at it and said, "That doesn't even match!" Imagine this, if you will: a royal purple and aqua striped polo shirt with what looks like a black Tshirt underneath (why? No clue, except that they can sell a $58 T shirt to put under a $79 polo shirt??) Pair that with a black, gray, red and white plaid skirt, black knee socks with white stripes around the top band, and red Converse-type sneakers....... So they are trying to influence people to spend a gazillion dollars making their kids look like colorblind homeless weirdos. I just don't get it. ---On page 92, they talk about "babymoons," which would be your last trip as a couple before having children. Now, I get this. Matt and I took a weekend in Maine at a bed and breakfast when I was about 6 months pregnant with Rachel, with the same idea in mind. However, their idea of this kind of trip is a trip to Iceland, complete with 5 star restaurants, hotels from $270 a night (I guess that's a bargain--it's cheaper than a cashmere T, anyway!) and spa treatments. For you less adventurous types, you can go to Bermuda or Napa....but if you plan to be so gauche, you'd better pay for a $620- for- two- hours spa treatment or a $200 hot air balloon ride. Never mind that most couples try to actually save money when they have a baby on the way. ---And let's not forget my very favorite article. That would be on page 108, and it's called Anatomy of a Country House. That's when you have a city apartment and an 1850's farmhouse upstate. And when you name your child Fenner. And when you have to redo everything because the house "hadn't been updated since the '80s..." (And yes, they mean the NINETEEN eighties, for you clever folk who say, well, it should be updated after 130 years...being that it's a 160 year old house!) And when you have collections you need to display. And when you need a sanctuary. And when you divide your acre yard into sections for outdoor entertaining, gardening, and kids' play areas...I think these people would be perfect to invite over for a barbecue. I mean, I would just love to get to know them, they seem so down to earth! As you might be able to tell, I could go on and on. However, since I am a real mom, living in the real world, I have chores to do, a birthday party to plan, and a basketful of laundry to do that probably all together didn't cost as much as one back to school outfit for a colorblind homeless weirdo! In a burst of industriousness last night, I finished up ordering books, which included finding a math program I liked for Julia. I did end up ordering from Rainbow Resources, because there were certain books I wanted that I couldn't find elsewhere, couldn't find for a better price, or had such a generic name that searches for the book was like hunting a needle in a haystack. (Good examples: Julia's reading comprehension book is called "Amazing Animals," and I got a workbook for Rachel entitled "Shakespeare.") However, I did end up spending a lot less by hunting around for bargains than if I'd just ordered from Rainbow...something on the order of $200 in savings. So my house will be Package Central in the next week or two. The Post Office and UPS are going to wonder if I'm starting a home business or something....there will be twenty one packages arriving in total! I love getting mail. I have been uncharacteristically procrastinating over choosing next year's school books. Now, I KNOW I procrastinate about a lot of things, but choosing books isn't usually one of them! In years past, once the kids are done with the school year, I spend time we would have spent on lessons going through my ginormous Rainbow Resource catalogue, circling every single text that interests me for any child. Then I winnow the lists down until I have covered all the subjects for each child, and place an order. I usually have all our books here by the 3rd or 4th week of July, at the latest. Not this year! I have been basically pretending that September is never going to come, and so there is no reason whatsoever to choose books. Yes, I have felt pangs of guilt about this. Yes, I have told myself again and again that I need to get moving. And yet, somehow something more interesting comes up every time--including scouring the kitchen sink, sewing Brownie patches onto Julia's vest, and watching grass grow! But face the music we all must, and my wakeup call came in the form of my letter from the school district, accepting the fact that once again, my kids are opting out of their wonderful system. In short--time to file paperwork. So I have to have my plan together. Now, this year I am doing things differently. I have mentioned my love of the Rainbow Resource catalogue. The reason I love it is simple: it has about four thousand choices in every subject and grade level, and because the family that runs the business is a huge one, they have personally tried every product in it. So each has a lengthy description of its strengths and weaknesses, and which type of kid does best with it. I love that! Most of the time, when shopping for texts, the goal of the company is to sell the book. Therefore, everything written is pretty positive. One great thing about homeschooling is the vast choice we have over which books to use--but that's also a drawback because it can quickly become overwhelming. And once you spend a bunch of money on books, you're loathe to stop using them, even if they aren't working. With Rainbow, I have a better chance of making great choices. HOWEVER. To say that the family who runs the business has "different ideals" than we do is putting it mildly. We are homeschooling for educational reasons. Religion plays absolutely no part in our homeschool. And when your husband is a Ph.D. scientist, talk of creationism does not exactly go over too well. In this catalogue, evolution is a nasty word, books are put down for mentioning magic or fantastical elements, and curricula that include Bible study are the norm. They have a whole section for teaching your daughters how to be meek and subservient----do I even need to say how well that goes over with me? I even saw a few books that bashed Democrats as being "evildoers who are using their liberal agenda to make money..." ?????????????????? So in years past, Matt has suggested that we might not want to funnel our money into the pockets of this family. I have always told him that it is by far the easiest way to order books, and while we do not see eye to eye with them, at least we are supporting a homeschool family business. However, this year I (for once) do not have a toddler or infant sucking up my time. My kids are at a much more independent stage than they ever have been, leaving me more time to search out other options. So I did go through Rainbow, but rather than automatically buying from them, I searched Amazon, Overstock, Half.com and ebay for better deals. And I found them. Even when I was charged for shipping, the totals still came out to be some fraction of Rainbow's prices. In several cases, I bought used copies in new condition for a penny, with $2.99 shipping--where the book in Rainbow's catalogue was ten or twelve dollars! It's a messier process, that's for sure. I can't just enter in thirty five items with Rainbow and get one giant box. I had to spend a couple of hours searching for and comparing prices. I had to check out several times. I will be getting books in a dozen shipments. And I placed bids on ebay--so those books I could lose and be back to square one. However, so far I have spent $112 on books that in Rainbow would have cost $206 so far. I am not finished, but I feel better now that I am on the way. And it even makes me the teensiest bit excited for the new school year. We had a day today! We had plans to get together with our friends, Amie and Evelyn (and baby Sadie), but hadn't planned what to do. When Amie and I spoke in the morning, it was such a gorgeous day we decided to spend it outside. We agreed to meet at Indian Island Park, where we could play at the playground, ride bikes and scooters, and go to the beach. Great. We ate lunch, packed snacks, put on bathing suits, got towels, bikes, and scooters into the car, and headed for the park. We went to the playground and the kids were all having fun, and Amie and I enjoyed ourselves chatting. For a while. Until the two park guys came up to the playground with weed whackers--we knew the noise was going to be unpleasant, so we gathered the kids and headed up the trails for the beach. The going was a bit slow--we had Emma on a trike, Ben on a scooter, there were some parts of the road that were sandy, and Amie had Sadie in a stroller with their gear and I had a stroller FULL of our gear. Plus we had to keep moving aside when cars would come by, which meant everyone stopped completely till the car was gone. It is a fair walk, not sure of the distance but it took our caravan at least fifteen minutes to walk it. Finally we hit the beach. A sigh of relief--we could settle here for an hour or two before we had to head home for the dinner rush. We looked at the sky. It was mostly blue, but with some threatening clouds over to one side. We thought, okay, well, let's just enjoy ourselves a bit more and then head home. WRONG! There were huge puddles, we could hardly see, the kids were alternately laughing and complaining, and all I wanted was to be out of this nonsense. Then the hail began. Yes, hail. As in little pellets of ice falling from the sky. Finally we reached the van and Rachel started it so she could shut the windows. I tossed stuff into the trunk willy nilly, jammed the bikes and scooters in, and gratefully got into the van. I had to take a towel that we keep in the front to dust the dashboard so I could dry my face enough to see; then we used the towel to dry as much of the dash and doors as we could. What a nightmare! When we got home, the work continued as I had to wash everything--clothes, towels, bathing suits, coverups, even Ben's hat had gotten soaked. Everyone was "freezing" and wanted a shower or bath and then to put on their pajamas. Plus the dogs needed walking, the mail was waiting, the snack bag had to be emptied (luckily everything remained dry in the zipped bag under towels), there was clutter around the house from our hasty departure that afternoon, and dinner to be made. I was so happy to get into dry clothes that I left my shower till after dinner. The rain was ending as we arrived home, but since then we have had several other showers, including a thunderstorm while the sky was bright and sunny. Who says the environment isn't screwed up??? So it's no secret that Matt and I allowed our kids to sleep in our bed. Rachel did not; she was fine in her crib, we were first time parents and that was how "they" said to do it. However, when we brought Julia home (and then Ben, and then Emma)--she utterly refused to sleep anywhere but on us or next to us. We tried the bassinet, the swing, the car seat, and even a crib. However, with each one of them, they would feel the sensation of being put down and would instantly be alert. I have never understood babies who just get put down and drift off to sleep. That never worked for us. Ours needed to nurse to sleep, and then there was no way to put them down. So it was the family bed, with the infant cuddled next to me, usually nursing, and sometimes the toddler (this would be Julia when Ben was a baby and Ben when Emma was a baby) cuddled somewhere on the bed, wherever there was room. Once they reached 7 or 8 months, we found that having them in their own bed worked fine. I would lie down and nurse them to sleep, easing out when they were down, and they'd stay that way--sometimes for only a few hours, sometimes for most of the night. But we could at least have some time to ourselves without baby in tow, and a couple of hours of uninterrupted sleep. Then we'd share the bed when they woke in the night, sometimes with two (baby and toddler). As you can imagine, this meant that we have had some rough nights in the past eight and a half years! Babies crying, toddlers thumping down the hall and wiggling in, nursing and nursing and nursing. Now that Emma has been weaned for months, we at least don't have the nursing! And Julia and Ben sleep solidly through the night. But Emma has continued to come into our bed at some point in the night even though there is no nursing involved. And after she weaned, I still let her fall asleep in my lap the way she was used to doing it--either while I was watching TV or at the computer. I would deposit her in her bed when she was asleep, and wonder when she'd come in to cuddle that night. However, about three months ago, I told her she was getting way too big to sleep on my lap. It was hurting my back, putting my legs to sleep--sometimes I could barely stand up holding her! So we began a new routine, one that worked very well. I would read her a story, then cuddle and kiss her for a few moments with some quiet talking, and then she'd fall asleep on her own with the light on. After she fell asleep, one of us would switch the light off, leaving just the night light, and at some point in the night she'd wake and come in with us the way she always had. Gradually I noticed she was sleeping most of the night in her bed, coming to us only rarely before 5 am. Then one night she woke when I was getting ready for bed, and I thought, here we go, now I have to stop what I'm doing and go in to settle her down again... but to my surprise, she turned, went back to her bed, flicking on the light when she passed the switch, cuddled back into bed, and promptly fell back asleep! Then last night, I woke during a huge thunderstorm, thinking it was maybe only 2 or 3 o'clock. (It didn't feel like I'd been asleep very long!) The rain made me decide I'd better head for the bathroom, and to my surprise, when I squinted at the clock it was 4:50 am! I went to the bathroom, and on the way back to my room, noticed that Emma's door was still closed, but her light was on! She'd apparently heard the thunder, too--but simply turned on her light and went back to sleep! I am really proud of her! Most kids are scared of thunder, so for her to stay in her bed is really sweet. And yes, I could say that I miss having a little one in bed with us...but I'd be lying! I truly enjoy having it just be me, Matt and various cats. And since Emma still cuddles with me every morning (she's a late sleeper, too, which is wonderful!) it isn't as though I was missing out on being close to her. Anyway, it just makes me happy, so I thought I'd share. Today my boy is six! Today has been a lot of fun. We got up and watched Ben open his gifts--unfortunately the camera is broken! So to my great dismay we couldn't take any photos. But I will try to have it fixed in a timely manner, or at least to get a disposable camera before birthday celebrations occur. He got Star Wars figures from Grandma B., Rachel and Julia--this was an unplanned coincidence, but he is ecstatic to have so many more and once we got home this evening he immediately started a game. Matt and I gave him a croquet set and the new Star Wars pop up book (if you haven't seen it, is a truly a work of amazing art. There are even light sabers that really glow!) both of which he has been wanting all summer. And Emma have him one of her teddy bears and drew him a card. Rachel also made him a card--she drew Yoda on it and it looks great. We went to church and shared birthday cake there, and then headed to Port Jefferson to Fun 4All--Ben's choice. Fun 4 All is one of those big indoor play spaces with trampolines, rope bridges, slides, etc. They have a 5 floor trampoline, in fact, with slides and ramps coming off it in all directions, and they have changed a bit since we last went there and added four gigantic bouncy slides/playground structures. Julia was a bit miffed that they took out the basketball court and ball pits with slides to make room for these, but after playing on them she was singing a different tune! And I was happy to be rid of the germ fest that is a ball pit, frankly. We played there for a few hours, then headed to Vincenzo's for pizza. Then rode home (thankfully Emma stayed awake, which is a minor miracle for 6 pm after a very full day!) and played a game of croquet on the lawn before getting ready for bed. 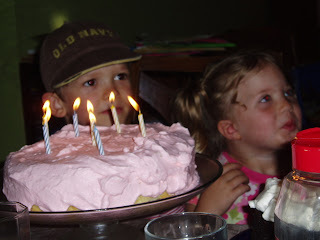 It was a really fun day, and Ben thanked me for making his birthday wonderful before he went off to bed. With such a wonderful boy---it was easy! First I want to note that before the youngers were all in bed, there were 8 more utterances of my name. Then Rachel brought the count to 9 more, so the final count for approximately 15 hours of time awake with kids around me was 265! Time to sleep. I need to rest up for tomorrow's onslaught. Well...it is now 9:00 and we are up to a whopping 248 times I have been called some form of Mother! I am not kidding, people. Is it any wonder I get irritated?! The good news is that 3 out of 4 are on the way to bed, so there will probably only be a dozen or so more from Rachel! Lately I have found myself very annoyed with how many times the kids address me personally. I find myself sometimes snapping, "WHAT?" only to be met with a sweet, "I love you, Mama..."
It is now 11:23 am, and so far the count is at 37. However, it should be noted that Emma and I slept till 9:15...so that 37 would be 37 times in 2 hours. Oh, now we're up to 41 all of a sudden.....sigh.